Colin talking about US beating Spain and his description of soccer players/fans. BTW: I'm 6'1" .. :) Classic! Which brings me to the now. This past week, Uncle Colin (as he refers to himself) was explaining why his kids won't play travel or comp sports. His feeling is that the time that would go to playing on a comp team would pull away from family time, and he wants the time with his kids to be spent traveling and experiencing things with them as a family. I totally get that. But I'm going to come at it from a different perspective. Yup.. that's me! Maybe 13 or 14 years old. I played travel soccer since maybe the 4th or 5th grade. By the time I was in middle school, the commitment was extreme. Not only time wise, but also financially on my parents. Now, as a kid I was pretty shy, and confidence wasn't a friend. I worked hard, and listened to my coaches, and I became a pretty good soccer player. My team won the state comp tournament several times. 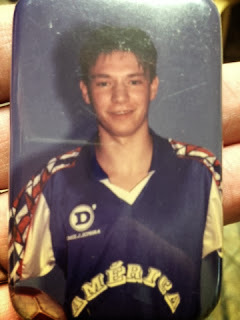 We traveled to some of the best tournaments in the country, and by the time I was in high school, my entire team and coach became part of a club in the Chicago area that became one of the best in the country (Sockers F.C.). And through it all, I was wiped. The intensity that came with being a comp athlete is difficult, and doesn't always bring with it the down time I feel kids should have. At one point in high school, I was playing 5 days a week (practicing three and games two). Throw on that my commitment to my school work, and a desire to fit in with some semblance of a social life and I simply felt exhausted and trapped. The fun of playing my favorite sport was gone, and shortly after my 18th birthday, I walked away. So, now as a parent, I use the experience I had as the basis for my thoughts on youth sports. First off, my kids aren't playing organized sports before the age of 5. And when they do, it'll be limited. Part of the problem that I see with youth soccer, for example, is that we get kids wrapped up into structured play so early that the creativity and fun is pulled. At the elementary ages, games are to be fun and youthful, and not at a level that brings stress to those involved (including parents). This is the age we have to build the love and enjoyment of the game. Second, my kids will play comp sports (or sports in general) when THEY want to, not because I want them to. This is not a slam against my own parents. They knew I was a good athlete, so they wanted me to compete at a level they knew was best. But, the decision wasn't alway mine. I will forever thank them for the opportunities they provided, because I'm a better person from them. But when I see 6 year olds in full pads on the football field I have to wonder if that is the kid wanting that or the parent? For me, I don't see a need for comp sports before middle school. I'm all for a fun Rec. experience for these kiddos, but when the target becomes WIN at ALL costs for an 8 year old, maybe the wrong message is being sent? And third, I'll be all for the comp experience when my kids show they're ready personality wise. Those that thrive in the comp atmosphere do so because of the attitude that they bring each day. The love of the game drives them to a determination to succeed that makes every training and game not work, but life. When they show a love for it that goes beyond just hanging out with buddies, but to a desire to create an opportunity for themselves in college and beyond then I'm in. And I'll go to the corners of the world to make it happen. But as soon as it become a chore for us all to "make" the kid even go to practice, then it's time to scale back and rethink the commitment. In the end, I truly hope that one of my four kids builds a love and passion for a sport that draws them in to wanting a comp experience. I, to this day, love soccer. I dream about getting back on the field. About heading a corner into the back of the net again. It was a huge, defining part of my life, but it became something that drained me to the core and in a way left me broken. So, while I'd love to have a kiddo play, I will never push it on them. I want their childhood to be about them, and their dreams. And if that means sports doesn't become a part of it, then I'm ok with it. And that's that. I just read this after getting home from LJ and LT's games. They're 3 and 5, but both begged us to play. We always keep it about having F-U-N and learning how to play. Landon's first practice was a bit overwhelming for him and we though maybe he wasn't ready but he really wanted to go back. He's loved it ever since. And we both agree that if there is ever a time when they don't want to play we won't force them to but if they really want to there's no harm in letting them try it out. Most of the leagues here are just for the kids to learn about the game and learn some beginner skills, and we are very aware of how the kids are treating each other. Now, if they want to try football, that'll have to wait until they're in middle school or high school. I don't think there's a need to be putting 6 yr olds in pads and clobber each other.